I was thinking that there is so many of us on here that talk and joke every day but that we really know nothing about each other. You don't have to participate but i was just curious how many people have kids, how old, what you do, how you found the site, pets?? Anything you want to share. I found the site searching for freebies.
! 30 yrs, congrats!!! My husband is w/ IT too. getting old at 37 with a 3 yrs old lil biatch, married for almost 4 yrs (long way to go for sunrae's 30) im a stay at home mom for more than 2 years now...i was preschool teacher and a call center agent in my home country. i cant remember how i found sampletrain but im glad i did! we have a cat named Socks and a dog named Kenzie. lmao!!! kenzie really hey, what kind of call center? yep my step daughter named her that b4 she gave kenzie to me. Widowed 6 1/2 yrs ago, we were married at that time 26 1/2 yrs. He was 46 when he passed. We have 3 children Amandajc_21 who is 25 attending college for her masters in teaching. And watches my granddaughter (almost 2) during the day of my second child boy who is 28. My oldest is 32, boy, and has 3 girls (10, 6, 3), who live in Texas (boo hoo). My son is in the Army and is currently serving in Irag. I worked for a Foster Care Agency for 10 yrs before being laid off recently. Before that I always worked as a Director of a DayCare Center. I found this site through another Freebie site when I was sent a PM asking to come check it out from a certain person who I met at the other site. I think her name was Laura!!! I have a very old cat named Simba! *I am 33 years old. *Angelica and I have been together for 2 1/2 years. I'm originally from Alabama, but made the move to Texas to be with her. *We have 2 kids. Alexis is 17 and a junior in HS. Just got her license and her first job (thanks goodness!!). Eloy (aka Pety) is 16 and a freshman. He plays football so we spend our Thursday nights in the fall cheering him on. They both accepted our relationship quite quickly and I'm so thankful for that. *I have been a Certified Nurses Assistant for 6 years. Worked 3 yrs on an Alzheimer's Unit in a nursing home and loved it, but the management didn't appreciate my love of them (or that I would go to bat for them) so we parted ways. I then worked at an orthopedic rehab hospital for 2 yrs. It wasn't as fulfilling so when I moved to TX I didn't feel bad. Right now, I am unable to work since Angelica can't drive so I'm her taxi to dialysis, Dr appts and work. *I found this site when I googled "Freebies" and haven't looked back. *We have 2 dogs. Jasper is a chihuahua/jack russell/italian greyhound mix and is 5 yrs old. Esme is a min pin and is 2. They are lovey and wouldn't trade them for anything. I am Married and my husband and I have been "together" 13 years we have one child who is 12. He is the light of my life! I found this site via Google I believe. I have (2) dogs, both rescues Flurry, and Shadow. hmmmmmmm this feels like therapy! i am 29 and many many many many years! i have 1 girl doggy that is 11 yrs old, 1 boy cat that just turned 14 but he is still the kitten of the house and 1 cat that is HUGE and he will be 7 in a few days. i had a daughter that i gave up for adoption and she will turn 21 in 3 weeks. i am still unemployed after 2 years 1 month & 25 days but who's counting.... my last job... i worked at auto trader magazines for 20 years before they closed the business as the office manager. i really LOVED my job as it was much more than just an ofc mgr. so now i am trying to make ends meet with my savings and of course all the freebies ! it is really amazing how much i dont have to spend just to bathe, brush my teeth and feed my animals with the free samples i have been getting. I received a pm from a friend from another site to check this site out and I absolutely love it here.....thanks for the invite. My dog, Captain Jack, died after 16 wonderful years and my cat, Spanky (who is 5) is so loving. I am so grateful for all the freebies I receive because they really help me out. This is a great site and I love coming here everyday! I am 32 and gladly went through a divorced over 5 years ago. Married to young but since my divorce I meet a perfect man, the man I love and we currently live together with our dog Roxy she's 4. She is our baby. I am a glassblower and make diaper cakes in my spare time. I am trying to expand into stained glass also. I am addicted to coffee and freebies! Well, looks like I'm the old geezer of the bunch. I'll be hitting the big 6-0, June 1st. 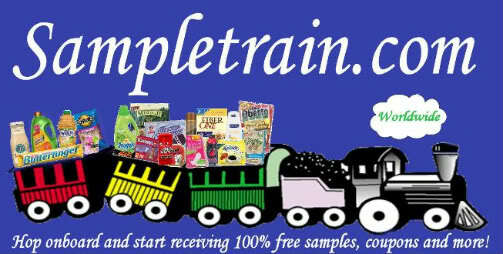 Thanks to Laura, I was invited to sample the Sampletrain. Now I'm hooked! I am married to a wonderful, wonderful man. It took me a few tries. I have two grown men and three granddaughters, scattered all over the place. I was a singer/musician/entertainer for almost 20 yrs., traveling all over our great USA. Built and owned a restaurant/nightclub, featuring the beautiful "Musical Waters", for years, ending in divorce. I moved to Kauai, Hawaii, and tended bar for Charo at her restaurant on the North Shore. Moved back to the mainland, and tended bar for another 5 yrs. at a fun neighborhood bar. I then changed careers. UHhhhh...kind of stayed in the hospitality business. I worked in Corrections, and retired early. Our jail houses over 4,000 inmates. I worked with males, females and juveniles. (You have the right to remain stupid.) Many could have just been booked in for aggravated ugly, alone!! I have many pets. We have a female, miniature, long-haired Dachshund, named, Moxie. She is 16 yrs. old. That's lots of years of lovin'. I have 6 Lady Gouldian Finches of all different colors. There's Red, Baby Boy, Beanie (boys), and Butter, Nina, and Maria. (girls) My hubby has a female Cockatoo, named, Gizmo. Gizmo is the bird from , and only likes my husband. She is about 33 yrs. old and has been in our family since she was a hand fed baby. As you can see from my avatar, I have a beautiful Palomino gelding. He's my lover boy. Champ is 20 yrs. old and is a rescue horse. He is the best horse ever!! Wow, guess I wrote a book. That's what I get for being old!! Wicked, I enjoyed reading what your wrote. You have a wonderful way of writing. Thank you very much. I think your horse is absolutely beautiful! Thanks, Kathleen. I loved reading your "story" as well. We really do have a lot of interesting people here on Sampletrain, don't we? I've enjoyed reading about everyone, and hope more join in! I agree. I hope more people join in! Yea, Laura, you're a baaaaaaaad girl....hahahahahah..... Only teasing....I am so happy to be here! Some of us know Laura got us here, now, we need to hear more about Laura. Laur-a, Laur-a, Laur-a....the crowd chants! I'm 26 yrs old and work for a police department as a 911 police dispatcher...LOVE it! I am married for a 1 1/2 yrs but together for almost 8 yrs to my husband who works as a computer engineer. Most of you know, we just had our first baby girl, Kenzie and she is 1 1/2 months already! We have a lab that is almost 2 yrs old and her name is Hannah. I LOOOVE my freebies and any way i can pinch a cent so i went searching for freebies. I came across a freebie site that i belonged to for quite some time. After awhile, i thought of some ideas and things that i would like to do or that freebie sites didnt have to offer and thought i could. SO, i decided I CAN do this and will! Once we hit 10 members i was estatic! and now almost to 2,200 members and we have come so far. i am loving all of the members that i have had the pleasure of meeting on here. I have NEVER met a group of people so friendly and willing to help each other out and care so much about people they have never met in person. I wouldn't trade this group for anything! I'm blushing, here. We love you, too, Laura!